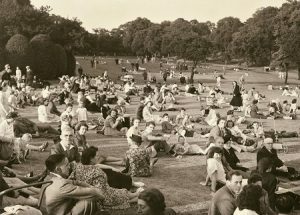 Locals relaxing at a concert, 2 July 1949. The Arboretum not only educated but entertained the people of Nottingham. 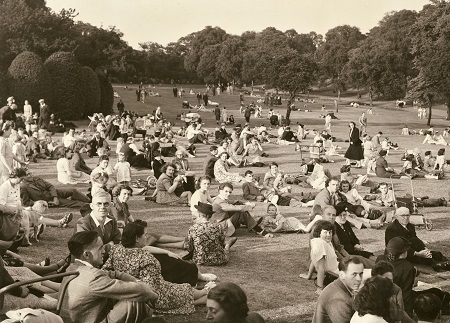 There were free weekly concerts, and a Quadrille band that played every other Monday. 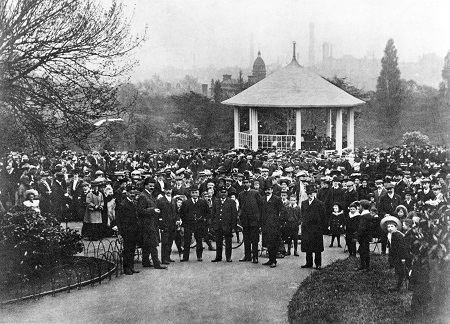 On one Sunday in June 1890, an estimated 15,000 people attended the afternoon concert. The refreshment rooms, adorned with elaborate wings, were designed by Henry Moses Wood (1788-1867) the borough Engineer. Originally it sold wines and spirits, but after 1893 following a series of public petitions from Temperance groups, spirituous liquor was forbidden though beer was permitted. In the 20th century the rooms became a pub, which was destroyed in a fire in 2006. 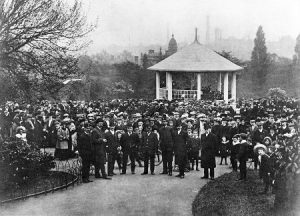 The Pagoda was built specifically to show off two cannons taken as trophies during the Crimean War, together with two replicas. Inside is a copy of the original Chinese Bell, reputedly stolen from a temple and presented to the town in 1862 by the officers and soldiers of the 59th and 2nd Nottinghamshire Regiment. The first aviary was erected in 1892 and stocked with exotic birds from across the world. Many were donated by townspeople. Purhaps the most famous and popular was Cocky, the sulphur-crested cockatoo, who was rumoured to have been 114 when he died in 1968. The aviaries face the lake and fountain, which were stocked with carp and wildfowl, including some vicious black swans. 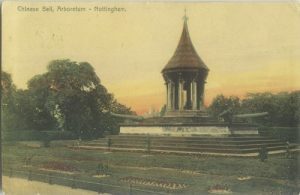 The Pagoda, Chinese Bell and cannons. 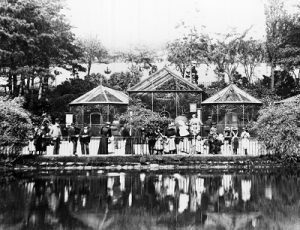 The Lake and Aviaries, c1898.